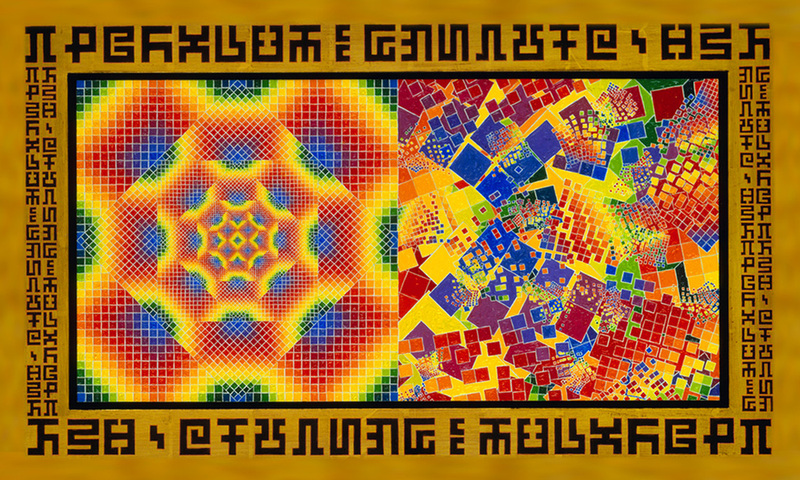 How visionary art is evolving the cultural body through icons of interconnectedness. Creativity is a cosmic force. We are aligning ourselves with the force of the cosmos that is continually evolving and recreating in every moment. We are a cosmic force in action. Our journey begins with ancient cultures and religions whose foundation came from a creative connection with the cosmos. Meeting in the moment, we look at the cosmic creativity in the context of the new planetary culture. From the present perspective, we are able to gaze out towards future cultures and religions that could emerge out of a renewed connection to the cosmos. Join our Cosmologue, as visionary artists and scientists, dancers, musicians, poets, philosophers and physicists explore the human in the context of the cosmos and celebrate the cosmic creative force. The model of Four Quadrants, as conceived by the preeminent contemporary philosopher, Ken Wilber, describes the relationship between inner and outer worlds, the individual self and the collective. This theory applied to art and the creative process has the potential to transform and evolve consciousness. First Quadrant: a vision illuminates the artist’s inner world. In the upper left quadrant of Wilber’s model lies the subjective conscious interior of an individual. We first experience an image in our minds. Second Quadrant: A vision or subjective state is expressed as an individual aesthetic artifact -- a painting, story, or dance. A thought becomes a thing. Third Quadrant: The artifact enters the collective systems of aesthetic reception in a gallery, museum, newspaper, magazine, website, etc. A work of art is reproduced on apparel and other merchandise. A video of a performance is posted. Fourth Quadrant: The artifact is absorbed into the meme-stream of the cultural psyche by a public interpretation of the meaning of the artwork, potentially transforming the collective interior. 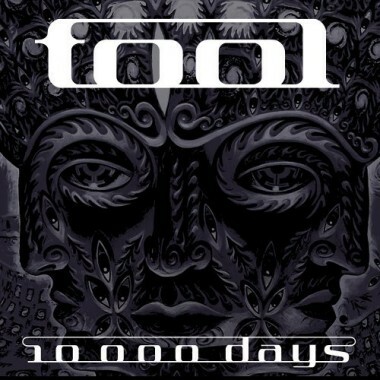 A tincture added to a body of water alters the entire body. So, artworks can color and anchor a collective’s understanding of itself, birthing a unique worldview of cultural meaning for that community. The altered Zeitgeist becomes a context for the next phase of visionary aesthetic inspiration and the grand round of art continues on it’s evolutionary path. Art is a way for the subjective inner world of the artist to be fully expressed into an outer world object. This creative process is inherently developmental because the psychology of “the subject of one stage becomes the object of the subject of the next.” Art literally objectifies the subject, allowing the artist the opportunity to witness and transcend a former stage of being. For example, an artist caught in a depressive state may be able to transmit feelings of despair into a painting. Observing the work of art can provide insight into emotions that catalyze a new level of maturity and uplifting. This is why art therapy works. 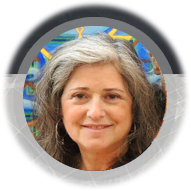 The artist discovers clues embedded in each work and creativity unfolds in a transformative path. To the beholder, art can be an attractor toward higher development. Icons of wisdom masters like Christ and Buddha, are models of what we might become. Portraits of Bodhisattvas, Angels, and Deities are Sacred Mirrors of possibility for our own enlightenment. 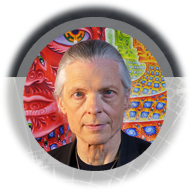 Alex Grey was born in Columbus, Ohio on November 29, 1953 , the middle child of a gentle middle-class couple. His father was a graphic designer and encouraged his son’s drawing ability. Young Alex would collect insects and dead animals from the suburban neighborhood and bury them in the back yard. The themes of death and transcendence weave throughout his artworks, from the earliest drawings to later performances, paintings and sculpture. Alex went to the Columbus College of Art and Design on full scholarship from 1971-3. Grey dropped out of art school and painted billboards for Columbus Outdoor Advertising, 1973-4. Grey then moved to Boston to study with and work as studio assistant for conceptual artist, Jay Jaroslav, at the School of the Museum of Fine Arts, Boston in 1974-5. 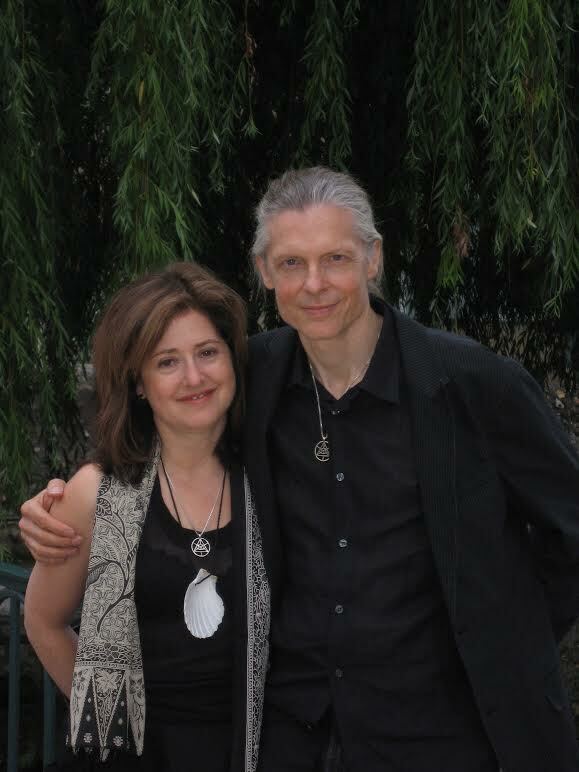 At the Museum School, Alex met his life-long partner, the artist, Allyson Rymland Grey. At their meeting in 1975, an entheogenically induced mystical experience transformed his agnostic existentialism to a radical transcendentalism. The Grey couple continued to take “sacramental journeys” on LSD. For five years, Alex worked in the Anatomy department at Harvard Medical School preparing cadavers for dissection while he studied the body on his own. He later worked for Dr. Herbert Benson and Dr. Joan Borysenko as a research technologist at Harvard’s department of Mind/Body Medicine, conducting scientific experiments to investigate subtle healing energies. 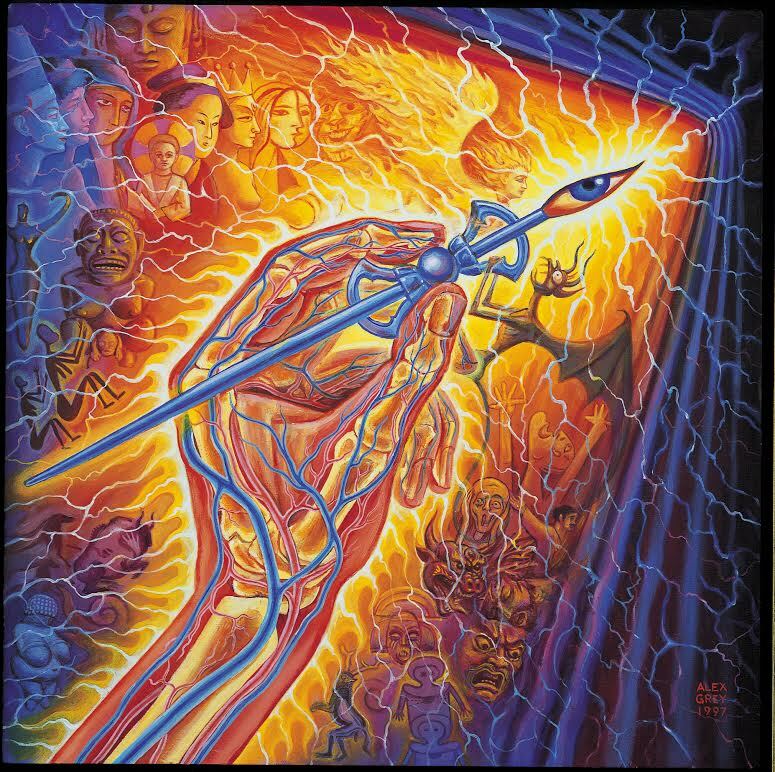 Alex’s anatomical training prepared him for painting the Sacred Mirrors and for working as a medical illustrator. 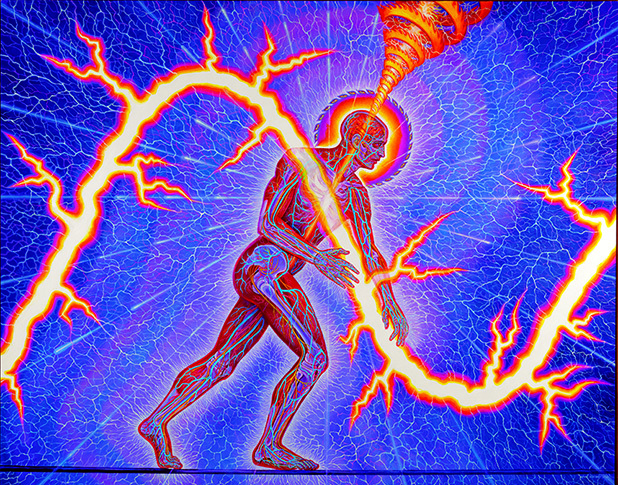 Doctors at Harvard saw images of his Sacred Mirrors, and hired Alex for illustration work. Grey’s unique series of 21 life-sized paintings, the Sacred Mirrors, take the viewer on a journey toward their own divine nature by examining, in detail, the body, mind, and spirit. The Sacred Mirrors, present the physical and subtle anatomy of an individual in the context of cosmic, biological and technological evolution. Begun in 1979, the series took a period of ten years to complete. It was during this period that Alex developed depictions of the human body that “x-ray” the multiple layers of reality, and reveal the interplay of anatomical and spiritual forces. After painting the Sacred Mirrors, he applied this multidimensional perspective to such archetypal human experiences as praying, meditation, kissing, copulating, pregnancy, birth, nursing and dying. Grey’s recent work explores the subject of consciousness from the perspective of “universal beings” whose bodies are grids of fire, eyes and infinite galactic swirls. Renowned healers Olga Worral and Rosalyn Bruyere express appreciation for the skillful portrayal of clairvoyant vision his paintings of translucent glowing bodies. Countless teachers and spiritual leaders, including Deepak Choprah, incorporate Alex’s art in their power point presentations. Grey’s paintings have been featured in venues as diverse as the album art of TOOL, SCI, the Beastie Boys and Nirvana, Time and Newsweek magazines, the Discovery Channel, rave flyers and sheets of blotter acid. Exhibited worldwide, Alex’s art has been honored with solo exhibitions at Feature Inc., Tibet House, Stux Gallery, P.S. 1, The NYC Outsider Art Fair, The New Museum in NYC, the Grand Palais in Paris, the Sao Paulo Biennial in Brazil. Alex’s art has been featured in several year long exhibitions at the American Visionary Art Museum including a room installation he created with Allyson entitled “Heart Net” (1998-99). A mid-career retrospective of Grey’s works at the Museum of Contemporary Art, San Diego in 1999. A keynote speaker at conferences all over the world including Tokyo, Amsterdam, Basel, Barcelona and Manaus, the international psychedelic community has embraced Grey as an important mapmaker and spokesman for the visionary realm. For 2011 an 2012, the Watkins Review named Alex Grey one of the top twenty spiritual leaders alive today, in the company of such towering luminaries as His Holiness the Dalai Lama, Eckhardt Tolle, and Oprah Winfrey. The Temple of Understanding awarded and sighted both the Grey’s as two of the world’s top fifty Interfaith leaders. 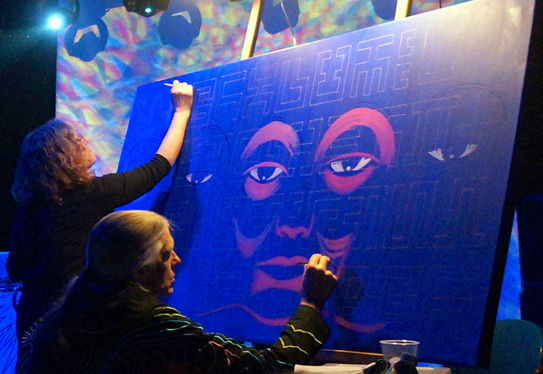 Grey’s first monograph, the large format art book entitled, Sacred Mirrors: The Visionary Art of Alex Grey, has been translated into five languages with well over one hundred thousand copies. His inspirational book, The Mission of Art, traces the evolution of human consciousness through art history, exploring the role of an artist’s intention and conscience, and reflecting on the creative process as a spiritual path. Transfigurations, Alex’s second monograph, contains over 300 color and black & white plates of his artwork. 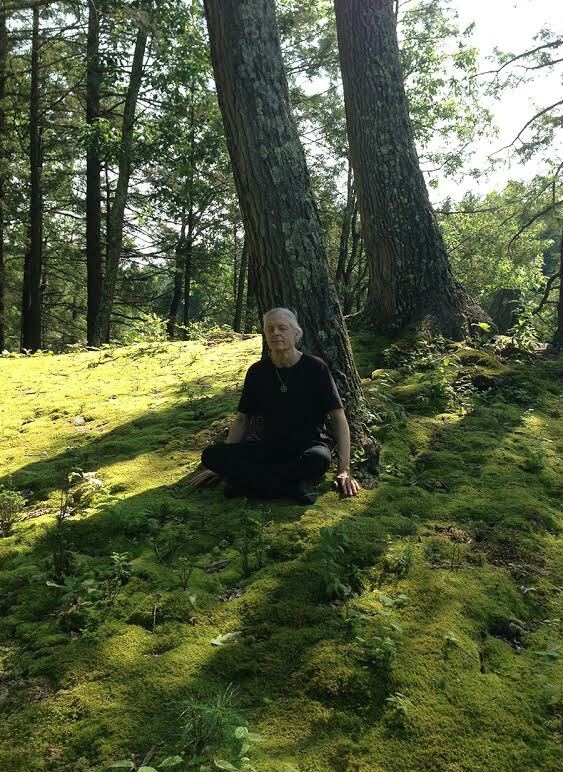 The Visionary Artist, a CD of Grey’s reflections published by Sounds True, leads the listener on a journey of art as a spiritual practice. The video, ARTmind incorporates Alex’s images in an exploration of the healing potential of Sacred Art. Grey co-edited the book, Zig Zag Zen: Buddhism and Psychedelics (Chronicle Books, 2002). In 2004, the VISIONS boxed set contains both earlier monographs of Grey’s artwork plus a portfolio of new works. 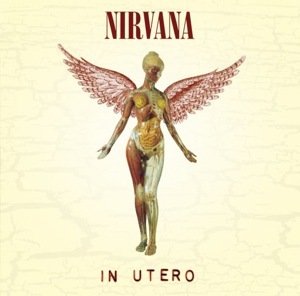 In 1976 during an LSD trip with my husband, Alex, I experienced my body turning into infinite strands of light that were both a fountain and a drain. 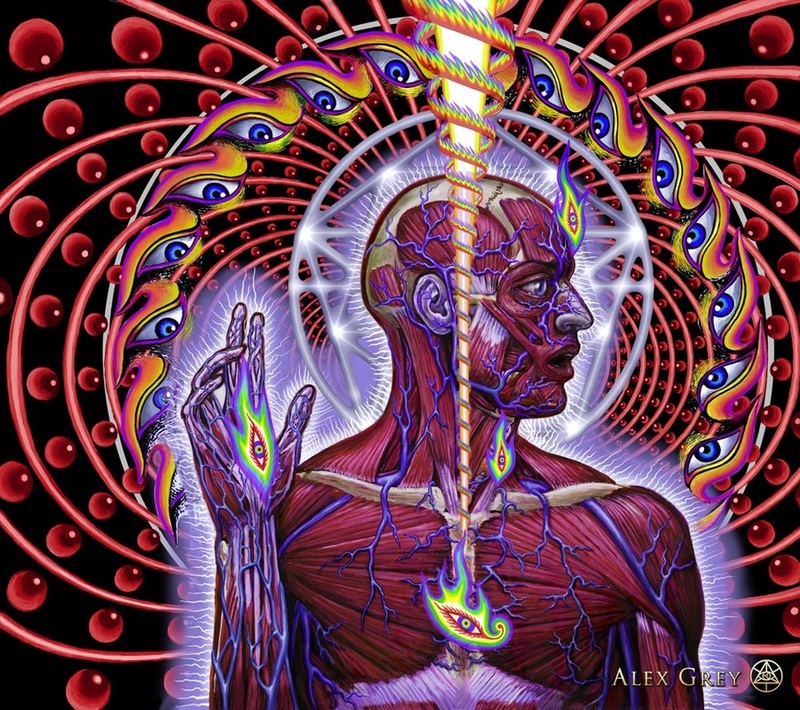 As I lay meditating next to Alex, I could see that he too had been revealed as a fountain and drain, individual and distinct but connected to my "energy unit". I realized that all beings and things were "blowing off" and "sucking in" pure energy in an infinite field of confluent effluences. 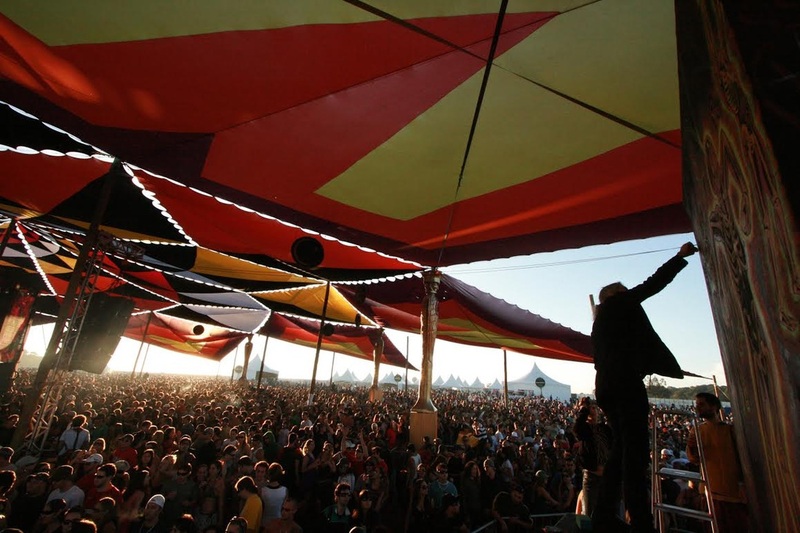 The energy was love, the unifying force. This changed both of our artwork as we felt that we had witnessed to the most important thing: a revelation of the grid upon which the fabric of our material reality is draped. Sometime thereafter, I read a quote describing the Jewel Net of Indra. In the abode of Indra, the Hindu God of Space, there is a net that stretches infinitely in all directions. At every intersection of the net there is a jewel so highly polished and perfect that it reflects every other jewel in the net. This description related powerfully to the revelation that we had received while in our altered state. It has been my continuing intention to point to this experience in my artwork. Intending to create spiritual art, I feel naturally attracted to abstraction and to a written sacred language. Every known religion reveres its holy writing. Sacred writing of all faiths, however, come into conflict through human interpretation as the written word defines the differences of philosophy and traditions, when truely the basis of all religion is unity and infinite love. In 1975 I began writing automatically in an invented or transmitted language. I do not give meaning to the symbols in my art as it is meaning that separates experience from expression. The alphabet that I use points to the notion of a sacred language beyond meaning. Some of the works call to mind the experience of seeing an illuminated text in a foreign language and religion. In recent work, I combine the icons of perfection (the Jewel Net) with the secret language, and images of chaos. Chaos in my art is the entropy of the units of spectrally arranged squares using a system of "planned randomness", allowing every spectral unit to fall apart in a variety of ways -- squares falling off of a corner or the spectral unit exploding from the center, etc. The three elements used in my work, Chaos, Order and Secret Writing, are non-literal representations of the sacred. 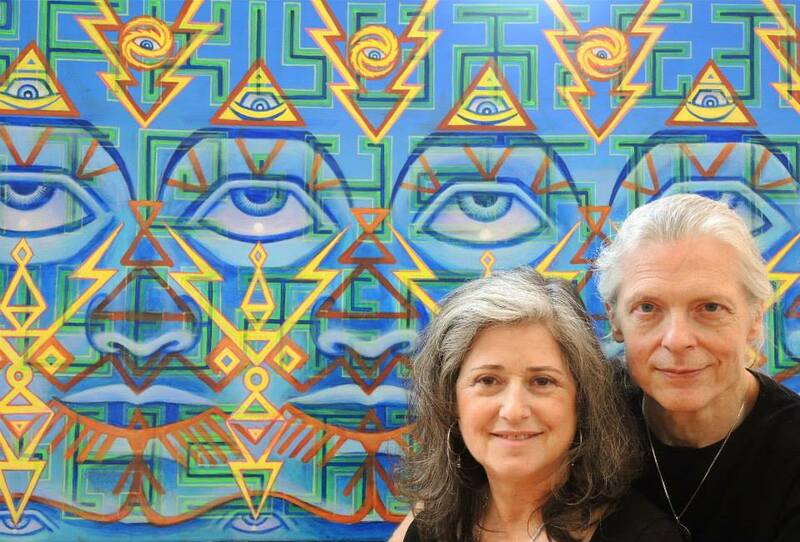 Born in 1952, I have been married to Alex Grey for 25 years. We met at the Boston Museum School where I received a Bachelors and a Masters Degree in Fine Arts. I've had one person shows at Stux Gallery and O.K. Harris Gallery in NYC, among others. Commissions of permanent public works include a 24 foot mural at the First Bank of Lowell, Massachusetts and my paintings have been collected by many corporations and individuals. I paint and collaborate with my very busy husband and adorable (and also very busy) actress daughter, Zena Lotus, in Brooklyn, New York.